It is a troubling sign that should worry you if you care about the mounting possibilities for an even more severe banking crisis in the not so distant future. Gold will be your best line of historically proven defense in such an increasingly likely scenario. Now is the time to review both the IRA-approved metals and the Top Five Gold Coins for investors before everyone else who is distracted by the ridiculously over-inflated stock market prices catches on and demands some protection too. As the largest bank in Britain, Europe and Hong Kong, (and likely the entire world when measured by its balance sheet assets of $2.5 trillion), HSBC is an important example to note as a representation of the global and U.S. banking industry. The mega European and Asian bank just had its North American banking division pass the Federal Reserve stress tests with apparently flying colors. The Fed was sufficiently impressed by HSBC's stress test performance to tell the London-headquartered bank that is possesses more than enough capital reserves. They went on to say they will allow them to draw down as much as $7 billion in U.S tied-down capital now and in the future. In fact HSBC was not alone in this notable success from the Federal Reserve stress tests. Every one of the 34 lenders subjected to them annually succeeded in passing them for the very first instance since they started conducting them after the 2008 era global financial crisis. But Are The Fed's Stress Tests Even Meaningful Any Longer? These unprecedentedly positive results from the Federal Reserve beg the question, “Are the stress tests still producing meaningful benchmarks for the banks to hit any longer?” Per the former stress test overseer and Federal Reserve official Carl Tannenbaum, the Fed seems to have suddenly decided to go easy on the U.S. operating banks in light of their decision to clear all of the major lenders with this most recent annual review announced last Thursday. Now the Northern Trust bank chief economist, Tannenbaum should know the situation intimately, as he once led the team based at the Federal Reserve Bank of Chicago. Their mission was to observe and carefully consider the financial risk in the banking system. He was also the head for the whole Federal Reserve System Washington D.C.-based risk group over a year long period. If you were to look at the returns on so-called risky bank debt, you would think that all of the danger for the banks both healthy and otherwise has passed. Such debt earned 9.4 percent in only the first half of the year, versus minus two percent in the same time frame last year. This belies the truth of what is really ongoing in this industry. Only last month, all of the junior bondholders at three significant banks in Spain and Italy were wiped out completely. Spain's Banco Popular Espanol SA became bought out by leading global Spanish Banco Santander SA for a mere one euro once regulators understood the bank was likely to collapse. Italy similarly had to hold emergency government meetings one weekend last month in order to appropriate 17 billion euros to cover the restructuring costs of both Banco Popolare di Vicenza and Veneto Banca SpA, pictured above. Their assets were basically given to Intesa Sanpaolo SpA. Nor is this the end of the banking problems plaguing Europe and the Western world. Italy's third largest and oldest bank Banca Monte dei Paschi di Siena SpA will soon have to be bailed out by the Italian state. This will also wipe out at least some of its bondholders. Portuguese Novo Banco SA also seeks to arrange losses for its senior bond holders so that it can facilitate a Lone Star Funds buyout of itself. The senior debt holders have already taken losses amounting to 2 billion euros back in the end of 2015. This problem is also not limited to European banks, though the issues may appear to be more obvious with the continent's financial institutions. The definition of a solvent bank is one that has substantially greater assets than it owes to its depositors. It must also have sufficient liquidity to meet the demands of its account holders. From time to time, they will actually want to get part or even all of their deposits back. In order to cover such requests, banks must have sufficient cash reserves. When they do not, they have to sell off assets at fire sale prices to cover their depositor demands. Such an action would likely be a harbinger of a solvency crisis for a bank that had to pursue such undesirable options. The Federal Reserve which just published these stress tests also releases its detailed weekly reports the “Assets and Liabilities of Commercial Banks in the United States.” Only last month, these reports demonstrated that the trend for banks is away from safety, not towards it. For the past two and a half years, this measurement of safety has been continuing to deteriorate with American banks. As this Federal Reserve data chart displays above, the dangerous trend reveals that U.S. banks' cash assets from the end of 2014 are in a continuous state of decline. Cash assets have deteriorated by approximately 25 percent at the same time as the deposit totals have increased by about 15 percent. What this tells you is that while the levels of deposits for the banks are rising in the United States, their cash amounts are decreasing. In fact the ratio of cash to deposits for U.S.-based banks has fallen by an alarming 32 percent from the end of 2014. This is a worrying sign of declining safety in the American banks. All the gold ever discovered in the entire history of the world amounts to $20 trillion in value today. This may sound like a great amount, but it pales in comparison to the value of potentially toxic assets which the Western world's banks are already holding. Italy's (so-far revealed) toxic bank assets alone represent well over half a trillion euros by themselves. Now is the time to secure some gold to hedge your retirement accounts. Gold makes sense in an IRA. Consider a gold IRA rollover now. 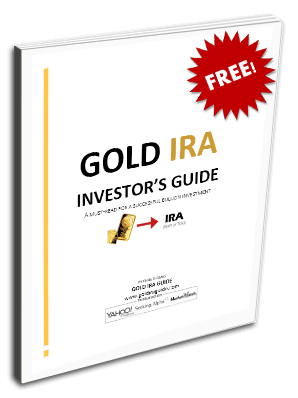 Investing in gold with a self directed IRA will protect you when all else fails.